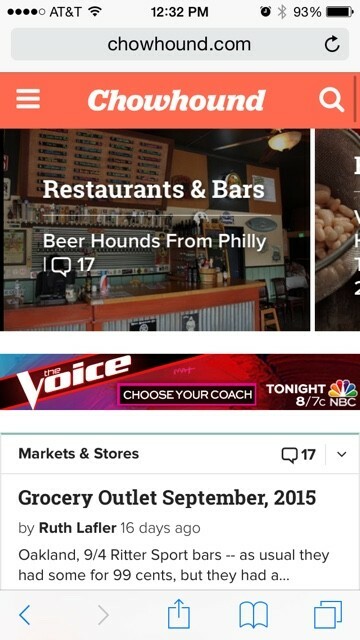 Screenshot of the new Chowhound.com interface, which launched on September 10. It is a truism in the world of user interface design that if you make changes to a popular website, someone is going to complain — quite loudly, in all likelihood. Anyone who has lived through the past three or four iterations of Facebook can attest to that. 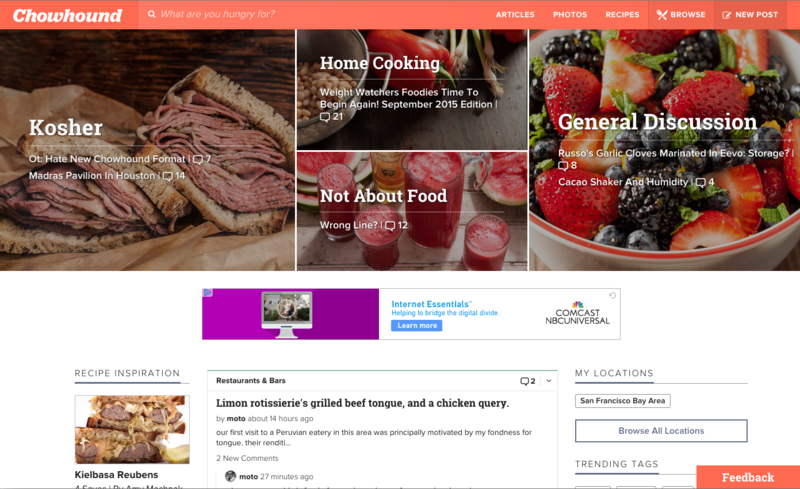 Even so, the overwhelmingly negative response to a recent revamp of the popular food discussion website Chowhound.com is notable for its intensity — and for its possible long-term ramifications on what had been a tight-knit, hyper-knowledgeable community, particularly here in the Bay Area. In the two weeks since the launch of the new site, longtime users have openly wondered if the Chowhound they had known and loved was either dead or dying, and at least one has already taken it upon himself to launch a new website as an alternative. Posting under the username “vipgeorges,” Georges Haddad, general manager of the San Francisco-based company, wrote a lengthy “Welcome to the New Chowhound” introduction in which he hailed a number of more fundamental changes — most significantly, that the site’s active regional discussion boards would be replaced by a “tagging”-based organizational structure. Almost immediately, longtime Chowhound users began to freak out. Hundreds of them flooded the Site Feedback board with their complaints, which ranged from lamenting the new “Pinterest-like” visual aesthetic to describing the interface as “chaotic and nearly impossible to navigate.” One thread was posited as a simple poll of whether users preferred the old format or the new. As of Monday afternoon, the results were stunningly lopsided: 170 users voted for the old design; only four cast ballots for the new. Many vowed to leave the site altogether. Longtime users are critical of how few discussion threads now fit on the screen on a smartphone. Most of the criticisms have fallen into two categories. The first has to do with the usability of the site. Most notably, the new design meant that instead of being able to scan the titles of fifteen or twenty discussion threads at a time, now you could only see two or three — even fewer on a mobile device. As a result, users had to do a lot more scrolling — past several more advertisements — to access the same information they used to be able to get in an instant. The other concern was the fact that the regional boards, which had long been the foundation of the site, had been replaced by a “tagging” system that many users found confusing and cumbersome. The fear is that if the sense of solidarity at, for instance, the board for discussing San Francisco Bay Area restaurants is weakened enough, and enough of the site’s core users choose to leave, then Chowhound will simply cease to be the area’s go-to online community for the food-obsessed. It’s that loss of community that is of greatest concern to Felice Lu, an Oakland resident who has been posting under the username “felice” since 2002. In an interview, Lu said she had already been worried that the Bay Area board had been less active in the past several months. “With the site change, it’s almost on its last legs, I worry,” she said. What’s more, Lu said that many of the longtime users feel disrespected because the concerns they raised during the redesign’s beta phase seemed mostly to be ignored. When a website such as Facebook loses a disgruntled user, it’s just a drop in the bucket, but Chowhound is unique in the sense that the users — particularly the core users — are the ones actually generating most of the content that makes the site such a valuable resource. Haddad was quick to take responsibility for the changes, explaining that Chowhound’s parent company, CBS Interactive, hadn’t given him any directives. In fact, he said he sold his superiors on his vision for a new Chowhound right around the time he was hired in March 2014. Mostly, the new design is intended to make the site more accessible to newcomers — to the person who stumbles on a discussion thread as a result of a Google search. Haddad also cited several improvements to the site that he believes are being overlooked; for instance, the new tagging capability means that in the future, a user might run a search on Chowhound for “mojitos,” and find not only great user-generated discussions, but also recipes, videos, and image galleries. “We would have the best mojito page on the internet,” he said. But is that the kind of thing that will appeal to the longtime Chowhound users — folks who have been scooping professional food journalists and finding hidden deliciousness in unlikely places for nearly twenty years? Time will tell. For now, many users seem to be taking an extended break from the site. Haddad declined to share any post-redesign site metrics, but by one measure, it’s clear that activity on the site is way down: For the past two weeks, there have been anywhere from ten to twenty new comments posted each day with the "San Francisco Bay Area" tag — far fewer, longtime users say, than the hundred-plus posts a day that used to be typical on the board. Sampson Shen, a Palo Alto resident who posts under the username “ckshen,” is one of several longtime Chowhound users who left the site due to his disillusionment with the redesign. Even though he doesn’t have any background in website design, he’s started a new, not-for-profit food discussion site, Hungry Onion, whose streamlined appearance recalls Chowhound’s olden days in the late Nineties, when a New York City trombone player named Jim Leff founded the site and ran it, ad-free, as a labor of love. So far, Shen said, several dozen users have signed up. Lu, for her part, is holding out hope that Chowhound won’t collapse outright, but if it does, she’s eyeing eGullet. And she has already made her first post — a review of the Uptown Oakland restaurant Calavera — on Hungry Onion. Disclosure: I, too, am a longtime Chowhound user and have posted for many years under a pseudonymous account that I created before becoming the Express’ food editor. In the future, if I do post on the forum, it will be using my real name. This decision is unrelated to Chowhound’s redesign.